1. Preheat the oven to 220°C, gas mark 7. 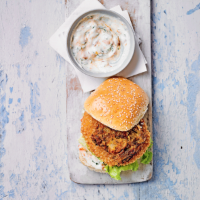 Place the chicken burgers on a baking tray and cook in the oven for 10 minutes, add the bhajis to the tray and continue cooking for a further 10 minutes until both are crispy and cooked throughout. 2. Meanwhile, mix the yogurt, mango chutney and coriander. Spread over the cut sides of the buns and top with the lettuce. Add the burgers and then the bhajis. Spoon over some yogurt and top with the bun lid. Serve with the remaining yogurt and some salad.